Many vacationers flying into Florida need to get a rental car to complete their trip. With the technological advances of today; most go online to locate and pay for their vehicle of choice. The rest of the consumers, wait until they get to the airport and go to the rental car counter to get a vehicle. Regardless of which way you decide to book your rental; there are steps you can take to ensure you don't get ripped off. Call before you go to avoid surprises. You should always call ahead to find out what type of cars the car rental office has available and the costs associated with renting the vehicle. This way you aren't surprised by unexpected expenses when you arrive to pick the car up. Additional items for a rental car can add up quickly, don't opt for the extras. Do you really need XM radio or a GPS system to navigate through Florida? Think carefully before you decide on these extras, a GPS system alone can add an additional $6 to over $13 per day. Should you opt for the car rental agency toll road transponder? Don't opt for the rental company's insurance coverage if you have your own. Most drivers already have insurance with their privately owned vehicles. These policies also cover rental cars. According to Consumer Reports, the cost of adding the rental company's insurance to your rental car could be an extra $60 to $250 per week. Make sure you thoroughly examine the vehicle before driving off the lot or you may be held accountable for previous damages. It is your job to make sure that there is no damage to the vehicle you are renting, if damage is found; annotate it on the inspection sheet. If you overlook any damages, you become responsible for them and that could be a costly mistake. According to the Florida Attorney General's office, rental companies use dubious tactics when negotiating rental contracts, so be careful. For the best rates, don't assume the corporate rate is cheapest. Always ask for the lowest rate. 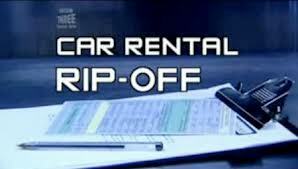 One of the biggest rip-offs for rental cars is the cost of gas to fill up the car. Some of the rental car companies charge over $8 per gallon if you fail to replenish the gas. If you wouldn't pay $150 to fill up your own tank; why would you pay it to fill up a rental? So remember, fill up that tank. Turn the vehicle in on time. If you go over the time allotted to return the vehicle; you will be charged late fees. Most have a fee if you turn it in early as well! With some company's; this cost can add up to another day's rental. Renting a car can be a necessity for many Florida vacationers. The chances to be ripped off will be minimized by following a few simple rules. Call ahead for pricing and car availability, don't get the extras, avoid their insurance, do a good inspection of the vehicle, and fill up the tank. By following these guidelines you can enjoy your vacation without the hassle of car rental rip-offs. Please check these car rental codes. Sometimes one rate code is a lot better than the other.